Pendant Lights can add a real ‘wow’ factor to your home, creating drama and personality. Decide what sort of light effect do you want? A really bright light or a more subdued effect? If you don’t already have one, consider fitting a dimmer switch to control the level of light, enabling you to create an ambient room. Take into consideration the number of wall lights and table lamps you may already have, which of course impact on the amount of light and the ambience of the room. Size also has to be considered, it must suit the space, for example if you have a small space with a low ceiling, you might not be able to have a pendant light at all. If your space is vast, with very high ceilings, then avoid small pendants, as they will look lost, and also give off very little or no light at all. 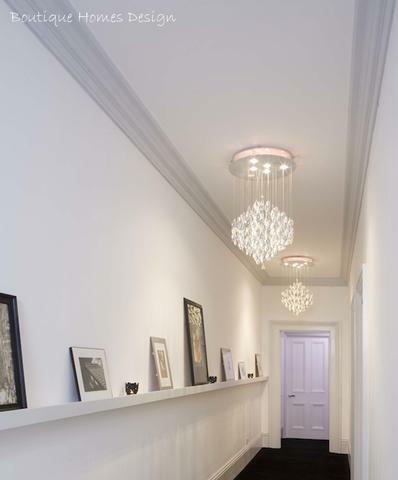 In a small room with a low ceiling a small pendant with a reduced drop could work, above the stairs, where you have vast ceiling height, a larger, statement pendant could work and provide great ambient lighting on your stairs. One area to consider this is over a dining table; you can go large here if wanted with one pendant; as a rule of thumb choose one sized between 1/2 and 2/3 of the width of the table. Alternatively use smaller multiples, normally 3 or an odd number (not even), either in a line, or together in the centre above the table. When hanging a pendant over a table the bottom of your ceiling light should be between 30″ and 34″ from the top of your table. If your ceiling is taller than 8′ then add another 3″ for every additional foot. Multiple small pendants also look good over a breakfast bar and tend to have more impact than one central one. They also look great over lounge seating, which means they don’t always have to be central in a room. Don’t forget to clean your light fittings from time to time so that the quality of light is not affected and REMEMBER to switch lights off and allow bulbs to cool down prior to cleaning. For Crystal use a small amount of mild washing up liquid diluted in water. Use a cotton glove to rub over each crystal with the soapy water and then use a dry glove to dry them. Alternatively if you can remove the crystals for cleaning and immerse them in the soapy water, rinse with clear water and leave to dry naturally. It’s worth noting the position of each crystal before you remove them, as they need to all be returned to their original position. You could be in a sticky situation otherwise.